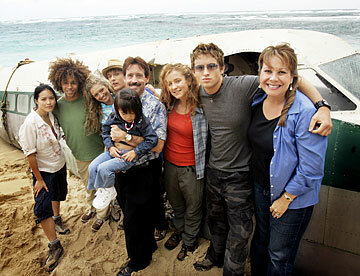 Huddled together on the Mokuleia beach site of "Flight 29 Down" are the cast and producers -- Kristy Wu, left, Corbin Bleu, Lauren Storm, Jeremy James Kissner, Rann Watamull (holding daughter Caitlin), Hallee Hirsh, Johnny Pacar and Gina Watamull. IT'S VALENTINE'S DAY, and Bernie Axelrod is finishing little treat bags for the cast and crew of "Flight 29 Down." The second assistant director is in her office trailer on Mokuleia Beach, sheltered from a brisk, offshore wind on this overcast day. Even though her usual duties include plotting the next day's work schedule on her laptop and keeping in contact with the on-set crew via walkie-talkie, she gladly does this extra for her work family. The next day would mark the halfway point of a three-month shooting schedule for the kids' adventure show that airs on NBC and the Discovery Kids cable channel. Even though the first season of "Flight 29 Down" won't finish airing until early next month, the small cast and crew is already shooting a second-season episode, to be seen on TV in the fall. Rann Watumull, who with his wife, Gina, heads Hawaii Film Partners, co-executive producers of the show, said the show is NBC's top-rated Saturday children's show, "even though about 40 percent of the episodes were pre-empted on NBC due to their contract with Notre Dame to telecast all of their home football games." The Watumulls, along with their spry 3-year-old adopted daughter, Caitlin, are regular visitors to the set. Gina is in the holiday spirit as well this day, bringing with her a tray of decorated chocolate cupcakes to be shared during lunch. 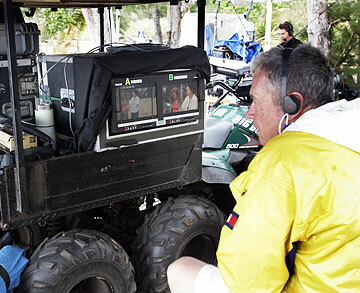 Director Tim O'Donnell follows the shooting of a scene. The show's directors were nominated earlier this year for a Director's Guild of America award for children's shows. "Flight 29 Down" is the story of a group of kids stranded on a Micronesian island after their plane goes down during an eco-camping adventure school trip. Today's scene, from the mind of writer and co-executive producer DJ MacHale, has the high-schoolers deciding whether to move the plane wreckage off of the beach and up to their campsite. Successive takes are shot in a variety of angles and close-ups with two video cameras, with the cast huddling under jackets and umbrellas when off camera. 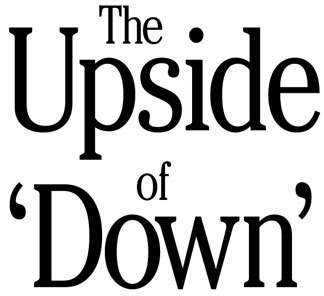 Season 2 will ramp up personality conflicts between the characters, and the episodes will continue to be interspersed with the young peoples' video diaries. While the locale is similar to another TV series -- you might have heard of it, a little thing called "Lost" -- "Flight 29 Down" deals more with issues of leadership and teamwork, without too much hormonal messiness. Speaking of hormones, the show has already turned out two heartthrobs: Johnny Pacar and Corbin Bleu, whose characters, Nathan and Jackson -- rivals on camera -- are favorites of female viewers. Pacar has an Internet fan site, and Bleu (who turns 17 today) was profiled in Teen magazine's "Who's That Babe?" feature and in the cast of the Disney Channel's surprisingly popular "High School Musical." He was reportedly mobbed by fans at the recent Punahou Carnival. Fellow cast members Hallee Hirsh* (Dally) and Lauren Storm (Taylor) also have their own Web sites. PRODUCTION has become an efficient operation, the crew adept enough to work under nearly any weather condition. During the lunch break, Watumull -- whose job is as a finance officer with Bank of Hawaii; wife Gina is an attorney -- goes over the criteria that Hawaii Film Partners followed in selecting this production. "One, it would be something our investors would be proud of. Two, to have a good collaboration with the creators, in this instance, DJ and Stan Rogue ('Lizzie McGuire'). Next, it would be commercially viable. And finally, our investors would be in the first position to be paid out." In 2002, Rann said, the Watumulls must have read through 100 scripts, "with 99 percent of them really bad and 1 percent just awful." McHale's script stood out, although it originally called for an adult cast and was shopped to the networks well before "Lost." When the Watumulls learned that Rogow and Discovery Kids were committed to it, the script was changed for a younger audience. The cable channel agreed to pay half the production costs. Watamull said the show's 13-episode budget is in the range of $5 million and that worldwide distribution is in place, with foreign sales starting in October in such markets as France, Belgium, Sweden, Finland, the Middle East, Latin America and Australia. The show's second season has been pre-sold as well. "It would've remained a little obscure if not for the worldwide popularity of 'Lost,'" he admits. "Thankfully, the show has done well. ... We've seen a groundswell in word-of-mouth activity, since Discovery doesn't do a whole lot of promotion ... and it's helped us to market the show as 'Lost' for kids." Between takes, actress Hallee Hirsh, kneeling, plays with Lucky, the set dog. With her are other cast members of "Flight 29 Down," Kristy Wu, left, and Corbin Bleu. "Flight 29 Down" is also being dubbed as "'Lord of the Flies' meets 'Lost'" by Penguin Group USA, which has published a series of book tie-ins with the series, targeted at readers 8 to 12. Two of the planned six paperbacks are out, each covering three first-season episodes. "Static" and "The Seven" are in bookstores, with "The Return" due in June and "The Storm" in August. Sony BMG will also market a CD of songs featured during Season 2, scheduled for release after the episodes' run is complete. BACK ON SET, everyone's back at their positions. Caitlin and 10-year-old cast member Allen Alvarado are sharing a sand bucket, playing behind the scenes. A neighbor's dog -- a quiet, friendly poi named Lucky -- is lolling on the sand a couple of feet from the plane set, eyes shut. McHale, whose easy demeanor matches the "life is good" phrase on his T-shirt, is a native Los Angelino who stays on Oahu during shooting. Standing close to the small production tent, he eagerly divulges what he can about what's to come for his cast. "We're going to show them, for the first time, in civilization, during a flashback at their school. It's an episode dear to my heart. Somebody gets sick, and it affects one character in particular and it's what got this person on this school trip in the first place. Because of the illness, that character's feeling guilty. "We've already gone off set, shooting at the Honolulu Zoo for a scene with a confrontation with a monitor lizard, played by a very hammy Komodo dragon. We'll also be doing a raft episode, which may make for some challenging water work, near Kahana Bay." Watumull remains hands-on -- so much so that he helped clear the beach location when it was chosen, has dug trenches and, because of his lifeguard background, even helped maneuver a raft from underwater during a shoot. "We want to show that we can have a viable film industry here, with a degree of local control, and help cultivate the business," he said. "We hope that our model will continue to work. "And this show, it's our baby." » "Flight 29 Down" actress Hallee Hirsh's name was misspelled as "Hale Harsh" on Page D3 Tuesday.